Toms River – November 25, 2015 – GlobalTech East Inc. today announced its participation in this year’s Small Business Saturday, taking place on November 28th. Small Business Saturday is a day dedicated to strengthening the community by supporting local small businesses. GlobalTech East Inc. will be offering a Free Website with the purchase of any Maintenance Plan to any customer who shops with us between November 28, 2015 to December 4, 2015. Created by American Express in 2010, Small Business Saturday serves as the ceremonial kickoff to the holiday shopping season for small businesses across the United States. In 2014, nearly 3,000 Neighborhood Champions rallied local businesses and created events and activities to drive shopping at small businesses around the country. The day was also championed by elected officials in all 50 states and Washington, D.C., including President Obama. 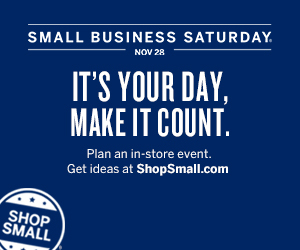 Merchants and consumers can learn more about Small Business Saturday and how to get involved by visiting ShopSmall.com and the official Small Business Saturday Facebook page. November 28th marks the sixth annual Small Business Saturday, a day to support the local businesses that create jobs, boost the economy and preserve neighborhoods around the country. Small Business Saturday was created in 2010 in response to small business owners’ most pressing need: more customers. ¹Small Business Administration Office of Advocacy Frequently Asked Questions, March 2014. Toms River– November 25, 2014 – GlobalTech East Inc. today announced its participation in this year’s Small Business Saturday, taking place on November 29, 2014. Small Business Saturday is a day dedicated to strengthening the community by supporting local small businesses. GlobalTech East Inc. will be offering 250 Free Business cards to any customer who shops with us between November 29, 2014 to December 5, 2014. Now in its fifth year, Small Business Saturday serves as the ceremonial kickoff to the holiday shopping season for small businesses across the United States. In 2013, nearly 1,500 Neighborhood Champions rallied local businesses and created events and activities to drive shopping at small businesses around the country. The day was also championed by elected officials in all 50 states and Washington D.C., including President Obama who took his daughters shopping at a local bookstore. Nov 29 marks the fifth annual Small Business Saturday, a day to support the local businesses that create jobs, boost the economy and preserve neighborhoods around the country. Small Business Saturday was created in 2010 in response to small business owners’ most pressing need: more customers. To date, more than 3.3 million Facebook users “liked” the Small Business Saturday page2. Just last year, 370+ advocacy organizations, 160+ corporations, and elected officials in all 50 states and Washington D.C. declared their support for Small Business Saturday. We treat every client with the same level of respect and importance, no matter how big of a campaign they need.